Houston Dyanmo fall short to Seattle on last home game of season. and Seattle Sounders in the second half. 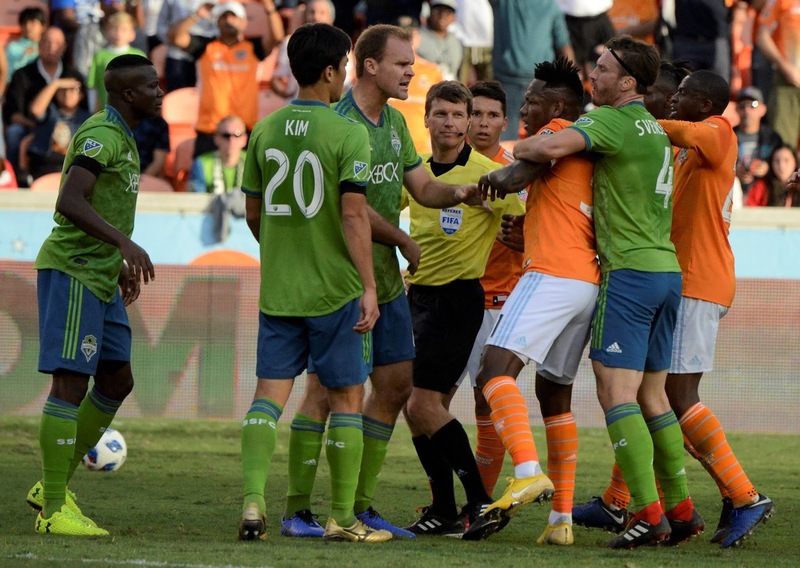 HOUSTON, TEXAS (October 21, 2018) The 19,000-plus fans at BBVA Compass Stadium was hoping for a comeback late in the game, but their wishes went unanswered as the Houston Dynamo dropped a close 3-2 decision to the Seattle Sounders on Sunday evening. The Sounders went up 2-0 by halftime, courtesy of goals by Chad Marshall and Gustav Svensson, with Houston cutting their lead to 2-1 14 minutes into the second half. Defender Kevin Garcia scored his first goal of the season for Houston, with an assist by Oscar Boniek Garcia. The Honduran posted his seventh assist of 2018. Fourteen minutes later, Seattle regained a two-goal lead, in the 87th minute, when Raul Ruidiaz drilled the ball past Houston goalkeeper Tyler Deric. The Dynamo added their second goal in the 89th minute, when Mauro Manotas slipped the ball into the goal past Seattle's Stefan Frei, to close out scoring for the evening. In the 38 games this season, Manotas leads the Dynamo with 23 goals. Tomas Martinez and Romell Quioto lead the team in assists, both with 11. Houston currently has a 1-3-0 record in October and dropped their home record to 8-6-3. The Dynamo close out the season on Sunday, October 28 with a road match against the Los Angeles Galaxy. BEAUMONT, TEXAS (October 20, 2018) Lamar University rushed for 435 yards, including 168 yards and two touchdowns from sophomore Myles Wanza, to upset No. 14 Sam Houston State, 41-23, Saturday night at Provost Umphrey Stadium. The Cardinals (3-4/2-3 Southland) took the lead with 2:55 remaining in the first half and never looked back. "I'm very proud of our guys today," said LU head coach Mike Schultz. "This is probably the most complete game we've played since I've been at Lamar. We did a very good job offensively. I must give credit to Dan Dodd and the offensive staff for coming up with a great game plan and executing that plan. "Sam Houston has a fast group of kids, and I think everyone saw that. You have to give credit to our defensive staff too. Troy Douglass and company did a phenomenal job getting our guys ready to play and they went out and executed. I felt like we played well in all three phases of the game," added Schultz. The Cardinals finished the day with 566 yards of total offense and were led by two players who rushed for more than 100. In addition to Wanza (who averaged 11.2 yards per carry), junior A.J. Walker added 23 carries for 121 yards. Senior Darrel Colbert, Jr., had 12 carries for 63 yards and two touchdowns, but was pulled from the game late after scrambling for his second score. Junior Jordan Hoy came on in relief completing 2-of-3 passes for 90 yards and carried the ball six times for 33 yards. "We felt coming into the game that we had a chance to run the football," said Schultz. "Our kids did a really nice job blocking down the field and taking advantage of some opportunities. We know Myles is capable of nights like this, but he just has not been healthy this season. He and A.J. are a good compliment to each other." Big Red's defense held Sam Houston State to 382 yards of offense and less than 100 rushing (79). The Cardinals' defensive effort was led by senior Davon Jernigan who ended the night with a team-high 16 tackles, including one for a loss. Classmate Rodney Randle ended the night with nine stops and three pass breakups, and last week's hero, Lane Taylor, added eight solo tackles and a PBU. For the Cardinals, it was their first win over a nationally ranked opponent since 2015 when it also defeated Sam Houston State, who was ranked third that year. It's also the first time LU has won back-to-back games since the 2016 season. For the Bearkat defense, the 41 points that LU hung on the scoreboard Saturday is the most surrendered by SHSU all season. After giving up the game's first score, the Cardinals rallied to score 17 of the next 24 points. Sophomore Elvin Martinez pulled LU within three with his 26-yard field goal less than two minutes after Sam Houston's game-opening score. Sam Houston pushed it's lead to 10, 13-3, after Colbert was stripped while passing the ball, and recovered by the Bearkats on the LU nine. Two plays later SHSU was in the end zone following a nine-yard pass from Ty Brock to Davion Davis. The Cardinals closed out the opening quarter with a six-play, 42-yard drive that ended with a 17-yard run from Wanza with 45 seconds remaining in the first. The score pulled LU back within three, 13-10. The score remained unchanged until under the three-minute mark when Big Red was back on the march. Colbert guided a seven-play 80-yard drive that ended with him scrambling for a 14-yard run for the score. It gave the Cardinals their first lead of the game, 17-13, which they took into the locker room. The Cardinals went into halftime with 248 yards of total offense, including 234 on the ground. Big Red's defense held Sam Houston State to 218 yards. Wanza ended the half with seven carries for 86 yards and a touchdown, while Walker had 13 for 79 yards. The Cardinals didn't waste any time picking up in the second half where it left off in the first. Colbert drove the Cardinals down the field in 2:09 and added to the lead with an eight-yard scoring run. The score pushed Big Red's lead to 11, 24-13. After a Martinez 25-yard field goal gave the Cards a 14-point advantage, Sam Houston surged back with 10-straight to cut the deficit to four, 27-23, with 1:51 remaining in the third. Hoy, who entered the game following the Cardinals' last score, answered the Bearkat run with another Cardinal drive. Hoy moved the Cardinals 75 yards down the field on three plays and ended with a 35-yard run from Wanza right down the middle of the field. The score gave LU a 34-23 lead with 57 seconds remaining in the third. The TD run was set up by a 38-yard pass to senior Isaiah Howard on the previous play. The Bearkats moved the ball deep into LU territory midway through the fourth quarter but the LU defense denied Sam on third down. On fourth, the Bearkats tried to quick snap the ball but got flagged for a false start and the Cardinals got the ball back. The Red and White put the game on ice with another score at the 4:55 mark. Hoy led the Cardinals on a 5-play, 65-yard drive that took 3:05 off the clock and eliminated any ideas of Sam Houston comeback. The Cardinals will go in search of its third-straight victory Saturday when they travel to Nacogdoches, Texas to take on Stephen F. Austin. It marks the Cardinals first trip to Nacogdoches since the 2012 season. The game against SFA will kick off at 3 p.m. from Homer Bryce Stadium. It can be heard live on Newstalk 560 KLVI. It can also will be televised on ESPN+. PASADENA-DEER PARK, TEXAS (October 14, 2018) Below is our Week Seven (for games played October 11-13, 2018) Top 10 Rankings for Texas UIL Class 6A Football. a few extra yards versus Deer Park. HOUSTON, TEXAS (November 12, 2018) The No. 2 North Shore Mustangs continued their run to an eventual district championship with a 75-13 win over the Deer Park Deer at Galena Park ISD Stadium on Friday evening. Their 75 points was the most this season over any opponent and put them in the driver’s seat of UIL District 21-6A with four regular season games to go. The Mustangs have outscored their opponents in their first six games, 302-46; averaging just over 50 points a game. In their past twelve meetings dating back to 2004, North Shore has posted a 12-0 record against Deer Park. Their 75-13 win was the most points scored against the Deer since their 51-10 win on October 21, 2004. Against the Deer, Mustang quarterback Dematrius Davis completed 9-of-11 passes for 135 yards and two touchdowns. Zach Evans carried the ball nine times for 141 yards while Shadrach Banks caught four passes for 77 yards and one touchdown. The Mustangs tallied 723 yards of total offense against the Deer, the most of the season; pushing their average-per-game to 456 yards. With four games to go in the regular season, Deer Park fell to 2-4 overall and 1-3 in district play. The Mustangs are a perfect 6-0 and facing an October 19 match up against Baytown Sterling (2-4 season, 0-3 district). After playing Sterling, the Deer will close out the regular season against Baytown Sterling (October 19), Beaumont Westbrook (October 26), Beaumont United (November 3), and Channelview (November 9). rank is listed behind the school's name.